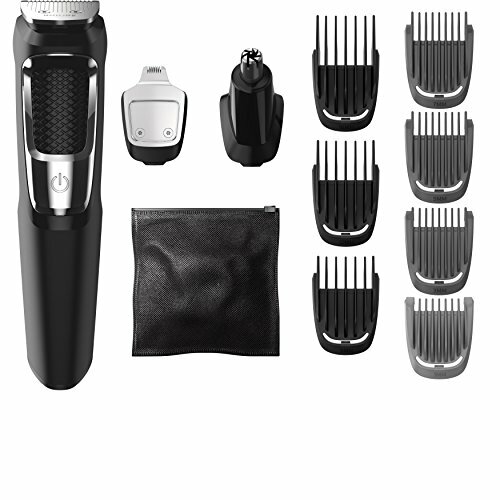 Enjoy best-in-class styling with our most advanced trimmer. DualCut blades deliver maximum precision for head-to-toe styling. The steel frame and rubber grips deliver superior control and the lithium-ion battery yields up to 5 hours of runtime. 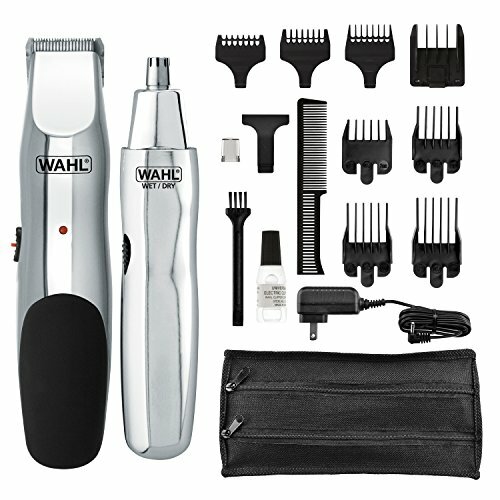 Wahl s Stainless Steel Beard Trimming Kit (Model #9818) is the complete kit that will meet every one of your styling and grooming needs! Perfect for trimming beards, nose, and ear hair, we ve thought of everything you could need to recreate your favorite styles every time: at home, travelling, or on the go! 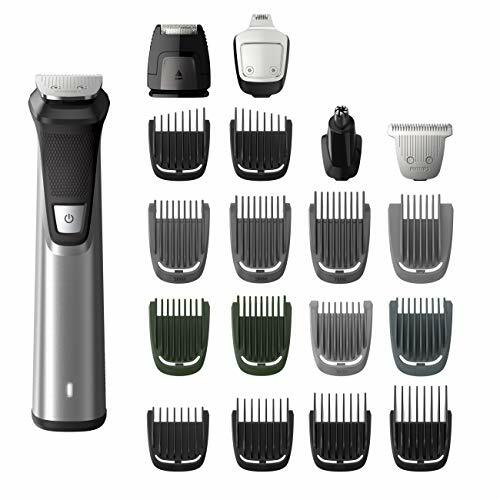 1 Rechargeable Beard Trimmer/Shaver/Razor T-blade Detail Shaver Head Rotary Ear/Nose/Brow Detail Head 12 T-blade Guides (See Below for Full List) Comb Storage Pouch Charger Cleaning Brush Blade Oil English/Spanish Instructions Additional Accessories Include - Facial Hair Guide Combs: No. 1 - 1/8 inches Guide, No. 1/2 - 1/16 inches Guide, No. 2 - 3/16 inches Guide, No. 3 - 5/16 inches Guide. Haircutting Guide Combs: T-Blade 1/8 inches Guide, T-Blade 1/4 inches Guide, T-Blade 3/8 inches Guide, T-Blade 1/2 inches Guide, T-Blade 5/8 inches Guide, T-Blade 3/4 inches Guide, T-Blade 7/8 inches Guide, T-Blade 1 inches Guide. Do not place or store appliance where it can fall or be pulled into a tub or sink. Do not place in or drop into water or other liquid. Quick charge feature: 1 minute charge = 3 minutes of trimming. Save money and look your best every day, no matter where you are, with the last word in men s grooming. 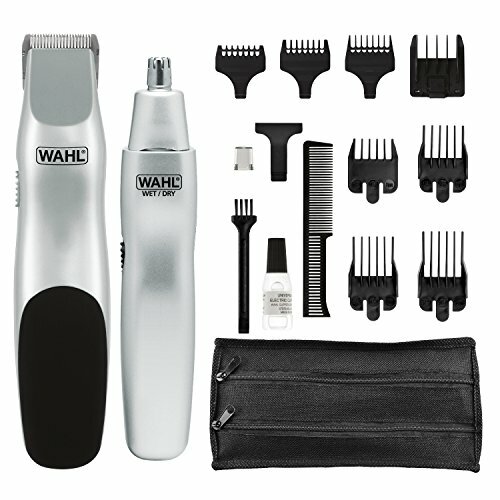 Add the Wahl Stainless Steel Beard Trimming Kit to your cart today! 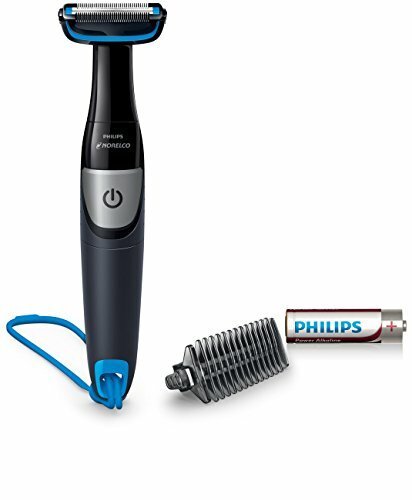 The Philips Norelco body groom 1100 allows you to conveniently and safely trim hair below the neck. 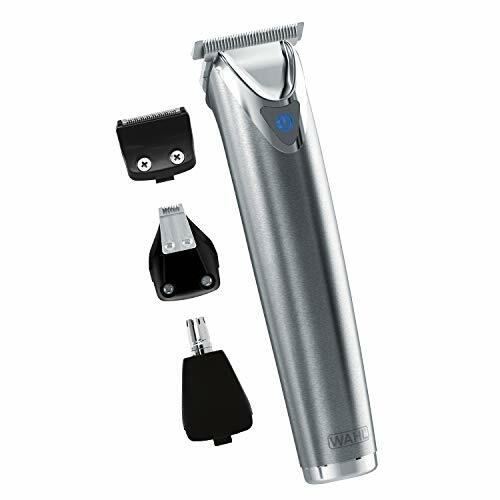 The integrated skin protector guards your skin while you trim, while the bi-directional trimmer lets you seamlessly cut hair in both directions. One 3mm comb is included so you can evenly trim longer hairs. The shower cord allows for easy storage. Body groom 1100 comes with a 45 day risk-free trial and a full 2-year warranty. Packaging includes: body groomer, 1 trimming comb, shower cord and aa battery power. 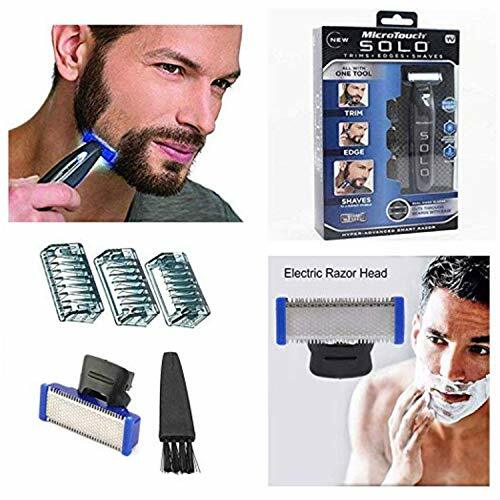 Reliable rechargeable trimmer best for beard, mustache, and stubble. Achieve professional results at home with the finest grade self sharpening precision blades. Adjustable guide comb 1/16" to 1/2", 3 stubble and 4 hair guide combs, charger, storage travel zipper pouch, and styling guide. 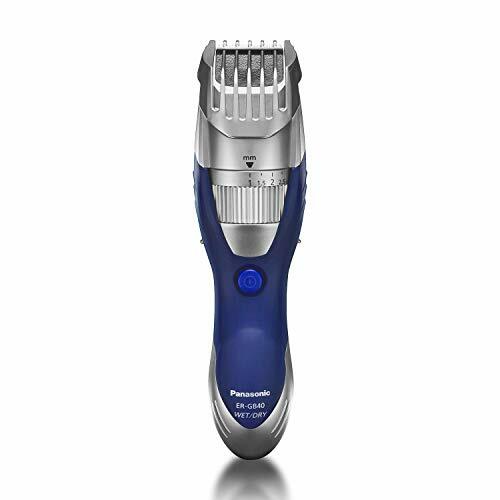 The powerful, versatile Panasonic Beard Trimmer ER-GB40-S for men can easily be used cordless anytime, anywhere or plugged it into an AC outlet for longer use. 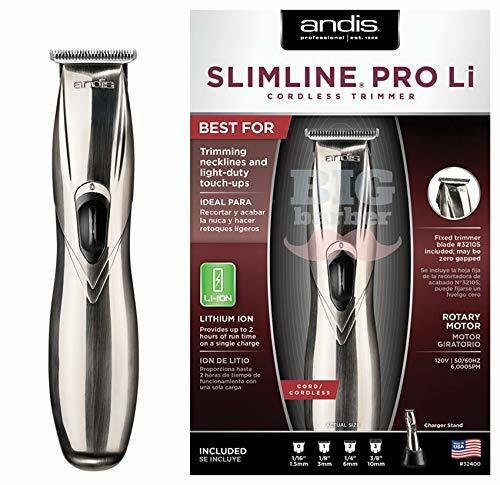 The durable, super-sharp blades in this powerful beard and mustache trimmer system are precision-honed to an acute 45 angle to create the optimal cutting edge for quick, efficient maintenance of beards, hair and mustaches. A quick-adjust trimmer dial is located on the sure-grip, ergonomic men's cordless trimmer handle to provide 19 precision settings from 1mm to 10mm for the exact length you want for smooth, precise trimming, sculpting, detailing and cutting. This Panasonic hair and beard trimmer for men is also wet/dry convenient. When you re in a hurry, the ER-GB40-S waterproof beard trimmer delivers a quick, even dry trim over the sink or on-the-go. And, because this Panasonic trimmer is fully immersible in water, it also performs just as effectively when used in the shower. Clean up is quick and simple. The Panasonic ER-GB40 beard and mustache trimmer cleans under running water with easy-open water drain for thorough cleansing and maintenance, and a handy cleaning brush is included for on-the-spot hair clipper blade cleaning. The included, high-efficiency AC charging stand keeps your mustache and beard battery charged and ready. An indicator lamp glows red while the Panasonic ER-GB40-S trimmer is charging. And for grooming away from home, both the compact beard and mustache trimmer and stand fit easily into any men's grooming kit, bag or luggage. Power source AC 120V. The Philips Norelco Multigroom 5000 is the all-in-one trimmer for maximum precision with 2x more blades. Craft your own personal look with this versatile trimmer, which includes 18 quality tools for styling your face, head and body. DualCut technology, which includes 2x more blades. The steel blades lightly brush against one another sharpening themselves as they work. This results in blades that are sharp as day 1 after 3 years of use. The no-slip rubber grip improves comfort and control. 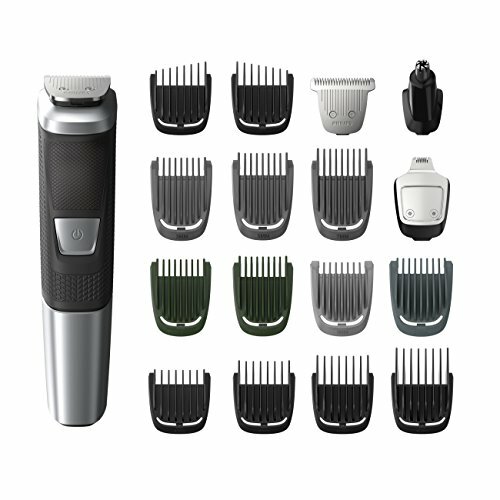 Philips Norelco Multigroom 5000 Contains: A regular metal trimmer, a detail metal trimmer, an extra-wide hair trimmer, a nose and ear trimmer, 3 beard trimming guards, 6 hair trimming guards, 2 body trimming guards, 2 stubble trimming guards, a cleaning brush and a storing bag. 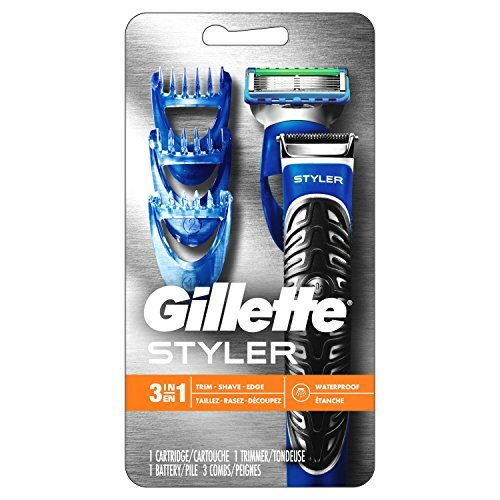 Master your style with one easy tool, the Gillette Fusion ProGlide Razor Styler. Trim with Braun engineered technology. Slim and easy to maneuver for even trimming. Shave with Fusion ProGlide Power for incredible comfort and closeness. Edge with Precision Edging Blade. Designed for crisp, defined lines. 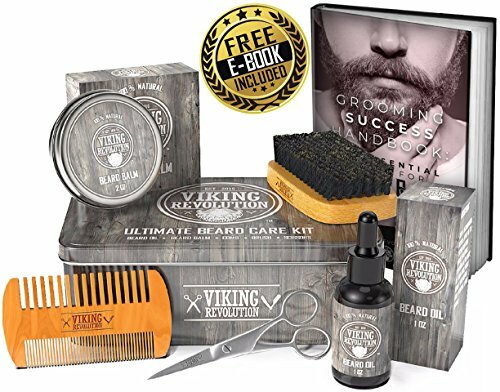 GREAT VALUE : Included in the kit are 2 fl oz of shampoo and 1 Oz of balm and 30ml,1fl oz of oil, plus the beard comb, boars hair brush and sharp stainless steel scis-sors and storage bag. Because a single shampoo retails for $10, it is not included in most kits,We encourage you to compare. A CLEAN BEARD IS A HAPPY BEARD Our wash, used twice a week, will help keep your beard heathy and shiny.It is formulated especially for beards and adds vitamins and & oils. Will not strip your beard of natural oils like regular shampoo. PERFECT GIFT FOR THE BEARDED GUY IN YOUR LIFE Looking for a gift for your loved one? -FULLLIGHT TECH beard set is an ideal introduction to natural beard care.Works great for any type of beard, long, short, thick or thin. Perfect stocking stuffers for men,cool unique christmas gifts for guys,best friends,boyfriend;top gifts for men, anniversary gifts for him,birthday gifts for men who have everything. 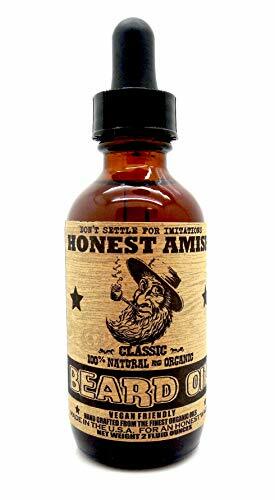 ArtNaturals Beard Wash is formulated especially to deal with the different kind of hair that makes up beards and mustaches, which is thicker, wirier, and more prone to tangling than scalp hair. Aloe vera soothes and smoothes, and helps combat beardruff as germ-fighter tea tree oil uses its antiseptic power to fight redness and inflammation. Argan oil unclogs pores and deep-cleans hair follicles as jojoba oil and shea butter, both full of vitamins, restore, rejuvenate and protect facial hair. Licorice root extract targets hair loss and aids in promoting regrowth, reducing beard and stache patchy spots. ArtNaturals Beard Wash is made with premium-quality botanical ingredients, and is paraben free and cruelty free. tones;No need for messy creams and soaps Great Gift for your loved ones, friends and family. We supply 24 hours online support, 90 days warranty.Any time, if you have any issue,please feel free to send e-mail. We will refund or replacement a new one by free and try our best to solver any issue for our customer. Ionic technology, less heat-related damage and a silky-smooth, shiny finish. Saves your precious time and money. Cuts drying time in half. 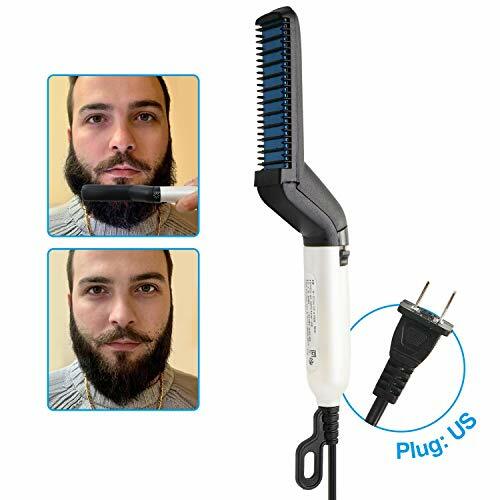 [Upgraded Beard Straightener 2019 NEW] - Want to achieve a straight and smooth beard? Beard Straightening Comb is the ultimate advantage in a world of average beards! and Our Beard Straightener is designed exclusively to straighten and smoothen for Men's facial beard easily. Using a low profile design and negative ion technology, Let's the heavy beard and a thick out of control beard can be transformed into a soft, smooth, and enviable look. [Quick heating & No Damage to Beard & Safe Use] - PTC instant heater heats up in 15 seconds, straightening Comb guarantees no damage to beard, and the Comb uses negative ion technology to prevent heat damage. Attaching the comb shields as a protective cover against the heating plate not only to prevent beard overburning, also its heat barrier design will prevent heat damage to your face, you can use Beard Straightening Comb daily for a healthy and polished beard look. [Long lasting, Effortless Style] - Combining the functionality of a hairbrush with the power of heat, the Beard Straightening Comb restores your beard to masculine, groomed perfection in just 30 seconds! Quality performance ensures that the styled result is long-lasting , you can image transforms your unruly beard into a masculine, groomed work of art in less then a minute. Nothing stands out like a masculine, tamed, beard finished off with a gentleman's touch. [Ergonomic design] - The handle fits perfectly in men's hands for a tight grip. It can also be packed in small bags which can be brought when traveling. [Money Back Guarantee & Discount Over 50%] - A Perfect Gift for Father day, Your men or your boy. FFHL promised 100% Money Back Guarantee for 30 days, no risk consumption, One-year warranty and friendly customer service standby in 24hr for you. 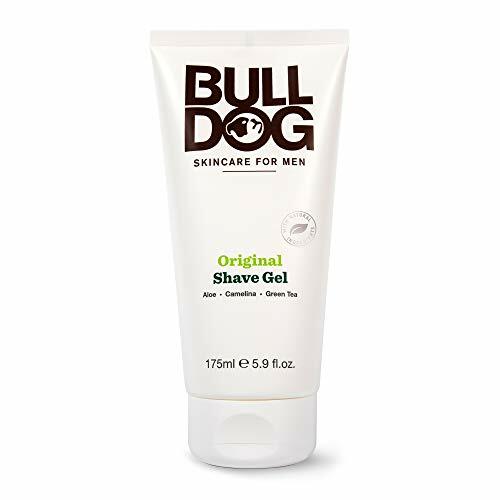 Ingredients: grape seed oil, tea tree leaf oil, jojoba seed oil, hydrogenated sweet almond oil, tocopherol, aloe andongensis leaf juice, orange oil, argan oil. Function: natural & healthy ingredients that will moisturize, soften and condition your beard, moustache or goatee and make sure that it looks and feels incredible! Ingredients: beeswax, shea butter, grape seed oil, coconut oil, argan kernal oil, jojoba seed oil, cedarwood oil, d-alpha tocopherol, rosemary leaf extract, lavender oil. Function: moisturize your beard, makes your skin feel fresh and cool. You will experience a noticeably softer beard and more hydrated skin. Clip it to the mirror and it catches all your hair. Have fun shaping your beard the way you like it without thinking of cleaning afterwards. 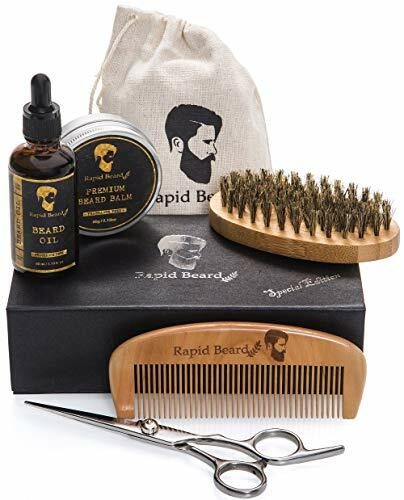 Our beard care kit also includes a shaping stainless steel scissors, wooden beard comb, bristle brush, and a storage bag. Our beard kit is ideal for anyone with a beard or mustache, or thinking about growing one. All the beard care products you need come in this portable, travel friendly gift box, which is perfect for both own use and gift choice. KOKOBI beard grooming kit includes a 2-month, worry-free guarantee to prove the importance we set on quality. If you have any question, don't hesitate to contact us! We will do our best to solve your problem asap! 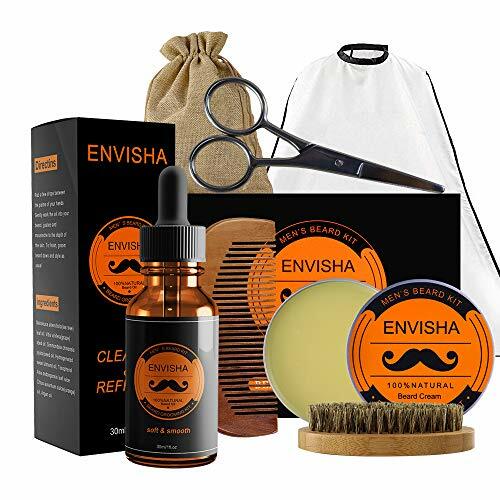 [7 in 1 BEARD KIT]: KOKOBI beard grooming kit contains all essential trimmer and growth products, including beard oil, balm, brush, comb, scissors, bib and a jute storage bag. 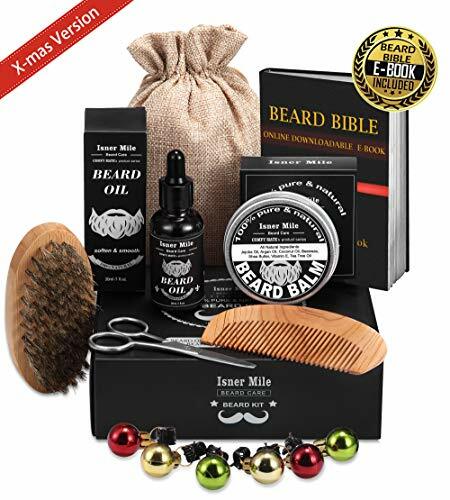 [UNIQUE GIFTS FOR MEN]: The beard care kit is packaged well in a premium gift box. 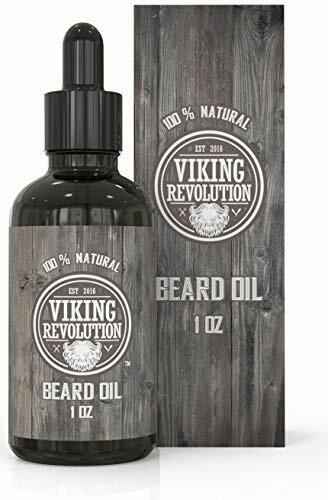 Best beard care gifts for men (friends, father, family, son, boyfriend, husband, lover) on Birthday, Valentine's Day, Father's Day, Christmas Day, anniversary, retirement, etc. 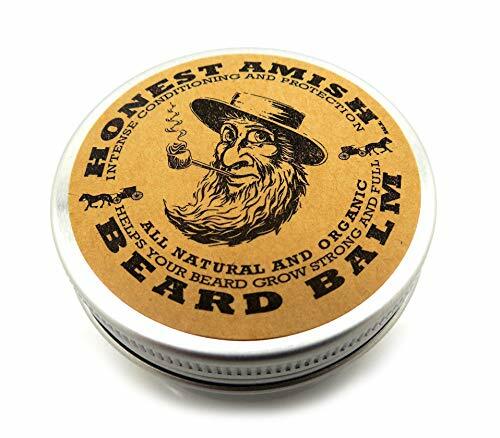 [SAY GOODBYE TO ITCHY OR SCRATCHY BEARD]: The beard oil and balm are made of natural plant material, which can moisturize, soften and condition your beard, and effectively prevent itching, dryness and bifurcation. [STYLING YOUR BEARD HAS NEVER BEEN EASIER! 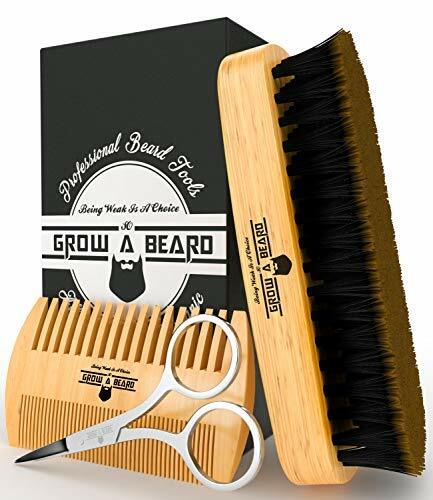 ]: The bristles beard brush, wood beard comb and sharp stainless steel barber scissors help you style, groom, trim and shape beard & mustache much easier. What's more, the hair catcher BIB makes cleaning up effortless. [GUARANTEE AND SERVICES]: KOKOBI beard grooming kit includes a 2-month, worry-free guarantee to prove the importance we set on quality. If you have any question, don't hesitate to contact us! We will do our best to solve your problem asap! 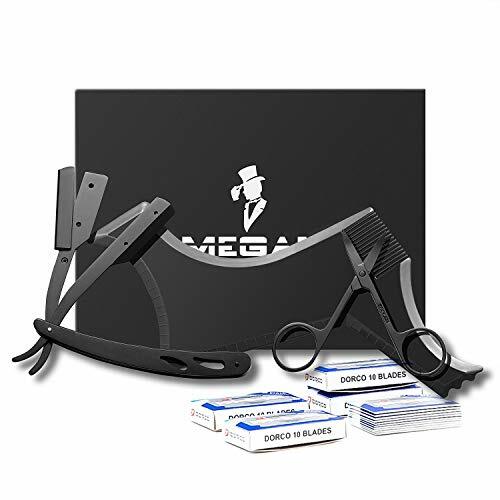 Megan Beard shaping tool kit for Men include shaping comb & Professional Straight Edge Razor & 10 Count of double edge blade & Stainless steel beard scissors,Gift box packaging. Spend a lot of time every day to care for your beard?Are you tired of the visits of expensive barbers, but do you want to keep your beard or mustache regularly and wear it neatly every day? I have great news for you.Try using Meagan beard shaping tool kit and you will find that you can do it as a pro - no more mistakes. This versatile beard shaping tool meets all your style needs,And all you have to do is enjoy the female attention. Beard shaping comb*1:Suitable for all face sizes, diversity of beard styling options. Professional straight edge razor* 1: black stainless steel exterior, ergonomic handle. Does not including blades. Stainless double edge blades*10 Made of high quality stainless steel, you can get 2 single edge blades by simply disconnecting from the middle. Be careful of your hands when breaking. Stainless steel beard scissors*1:Port bevel design better fit the face easily repair your beard. Wrapped in a black premium gift box, suitable for giving to your boyfriend, husband, boss, colleagues, etc. as a gift. Do you want to change? Do you want to change him? Change your or his beard! Having it, it will be the first step to change you or him. Join the shopping cart now! New upgrade: We have added high-quality double edge blades to the kit to enhance the customer's shopping experience.Beard shaping tool kit for Men include shaping comb, Professional Straight Edge Razor, 10 Count of double edge blade and Stainless steel beard scissors. 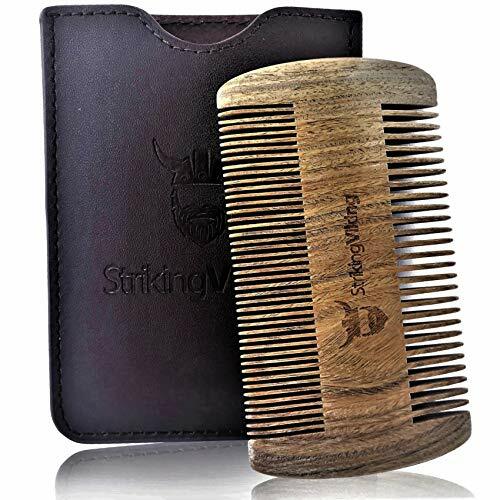 Beard Shaping comb: Using this Shaping comb, you can get a perfectly symmetrical beard shape ,cheek line, neck line, jaw line, moustache, goatee, sideburns and more. Professional: straight edge razor made of stainless steel, the ergonomic handle.Plus the stainless steel double edge blade in the kit makes it easier to organize your beard. A kit meets your needs for finishing your beard. Double edge blade:The double edge blade can meet the needs of different equipments. It is very simple to get a single edge blade. Take a double edge blade and break it from the middle. It is easy to get 2 single edge blades.The blade is made of high quality stainless steel, please be careful when breaking it. Perfect gift and service: This set is packaged in a black luxury gift box. This is the best gift to a friend, colleague, family member or husband.If you have any questions about our products, please contact us immediately and we will respond within 12 hours. ArtNaturals Beard Conditioner is uniquely formulated to deep condition the thicker, more wiry hair of beards and mustaches, soothing and smoothing for easy styling. Aloe vera moisturizes hair and skin, reducing irritation and beardruff, while tea tree oil uses its antiseptic power to fight itch, redness and inflammation. Argan oil deep-cleans pores, jojoba oil and shea butter, renew, replenish and revive facial hair, as quinoa protein thickens hair, revving up shine. Licorice and nettle root extracts combat hair loss and jump-start regrowth, helping fill in beard and stache patchy spots. ArtNaturals Beard Deep Conditioner is made with premium-quality botanical ingredients, and is paraben free and cruelty free.